When you’re a football player, the end zone is the place to be. However, when you’re zombified, you’re kind of stuck in the “dead zone”. Although that isn’t always a bad thing! When you’re a zombie that loves to play football, getting to that end zone is a lot easier. Nobody want’s to take their chances tackling a member of the living dead! Grab this Dead Zone Zombie Costume and victory will never have tasted sweeter. With this costume, you will look like the star player on the undead football team. Is it your supernatural strength or your killer precision that makes you the MVP? We have no clue, but one thing is for sure. 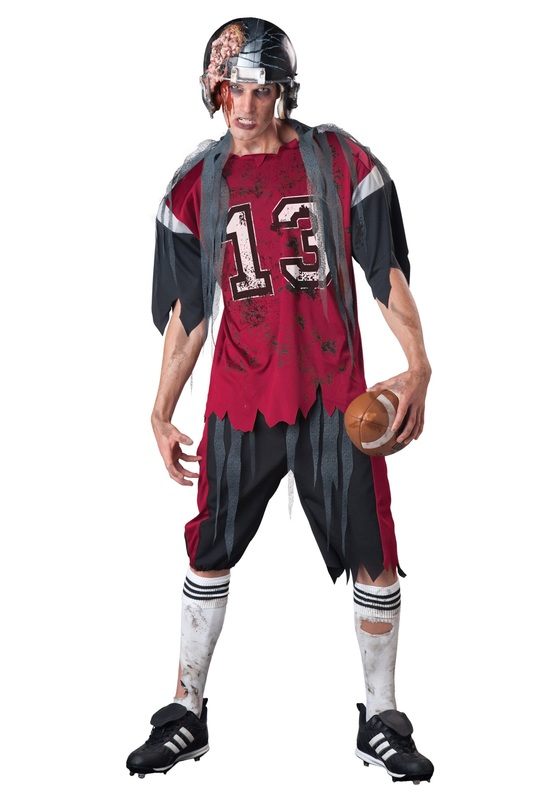 The devastating intimidation you gain with this costume definitely comes in handy out on the field. The jersey is frayed and stained (with dirt or blood is up to you) and on top of that, it also has the notoriously unlucky number 13 printed on it. Perhaps the infamous number was the cause to your current undead state or maybe it will let your opponents know that today isn’t their lucky day. The costume will also come with a pair of pants in just as worn conditions as the jersey and a helmet with molded brain matter on it. Grab a football and a pair of cleats and you’ll be ready to lead the horde onto the field this Halloween! Be more than just another zombie stumbling around the party scene this year. Be a Dead Zone Zombie with this amazing costume and show everyone that zombies have hobbies too!